Three North American pipeline industry leaders - Enbridge Pipelines Inc., TransCanada Corporation, and Kinder Morgan Canada - have signed a Joint Industry Partnership (JIP) agreement to conduct research into aerial-based leak detection technologies, in the interest of enhancing across-the-board pipeline safety. This partnership illustrates a spirit of collaboration among TransCanada, Kinder Morgan and Enbridge in the continued common pursuit of industry-wide safety and operational excellence. It also demonstrates the partners' commitment to investing in the leading-edge tools and technologies that can bolster safety and reliability, while at the same time addressing public demands for responsible pipeline development. The goal of the project is to identify technologies capable of viably detecting small leaks from liquid petroleum pipeline systems to improve pipeline safety. The project is expected to involve laboratory research and field trials to evaluate the feasibility of commercially available aerial-based leak detection technologies, for use with crude oil and hydrocarbon liquids pipelines. The partnership includes a funding commitment from all three companies. Data analysis will be conducted by Alberta Innovates - Technology Futures, and testing will be carried out by project research partner C-FER Technologies (1999) Inc. of Edmonton. A previous Joint Industry Partnership (JIP) - which was established by TransCanada and Enbridge, and now includes Kinder Morgan - has already yielded groundbreaking leak detection research using a state-of-the-art pipeline simulator known as the External Leak Detection Experimental Research (ELDER) test apparatus. "We are committed to identify, develop and test new technologies to further progress key areas of pipeline safety, such as leak detection. Through collaboration with committed industry partners, we continue to make important advancements with leak detection technology," says Kirk Byrtus, Enbridge's Vice President of Pipeline Control. "This extension to the Joint Industry Partnership is another great example of the pipeline industry connecting to make important advancements with leak detection technology, and we look forward to closely working with our partners, TransCanada and Kinder Morgan." "Pipelines are widely accepted as the safest and most efficient way to transport oil and gas, and TransCanada continues to strive for zero leaks or safety incidents on our pipelines," says Vern Meier, TransCanada's Vice President of Pipeline Safety and Compliance. "Joining forces with Kinder Morgan and Enbridge helps us maximize research potential and reach new levels of technological innovation to improve our industry as a whole." "Kinder Morgan is pleased to be participating in this project as part of our systematic approach to leak detection, and our fundamental philosophy of continuous improvement and safe operations," says Dan Carter, Director of Central Region and Control Centre, Kinder Morgan Canada. "We look forward to working collaboratively with TransCanada, Enbridge, C-FER Technologies, and the participating vendors as part of this evaluation process." Kinder Morgan, Enbridge, and TransCanada have each committed $200,000 to this partnership agreement. All three companies involved in this partnership agreement will share equally in the new knowledge and advancements that can be applied directly to improve safety and efficiency in their respective operations. Potential technologies to be tested may include infrared camera-based systems, laser-based spectroscopy systems, and flame ionization detection systems, with sensors suitable for mounting on light aircraft or helicopters. Representatives of Enbridge and C-FER Technologies are currently surveying commercial vendors of these airborne leak detection technologies to validate their feasibility for liquid hydrocarbon pipelines. Project research and trials are expected to begin during the third quarter of 2015. "The challenge with airborne leak detection systems is not with the aircraft, but with selecting appropriate sensors to detect liquid hydrocarbon leaks before they reach the surface," says Brian Wagg, Director of Business Development and Planning for C-FER Technologies. "This program helps operating companies understand which technologies are best suited for detecting these leaks, and will provide vendors with unique information on what leaks actually look like. This information will help those vendors fine-tune their systems to detect leaks with greater reliability." Meanwhile, work on the ELDER leak detection project, originally announced in December 2013 by Enbridge and TransCanada, continues at C-FER Technologies' Edmonton research facility. Enbridge and TransCanada have each committed $1.6-million to the ELDER project, while Kinder Morgan has committed $1-million. The project has a total funding commitment of more than $6-million. Engineers from C-FER Technologies, Enbridge and TransCanada performed a series of tests throughout 2014 on four external leak-detection technologies - vapor sensing tubes, fiber-optic distributed temperature sensing (DTS) systems, hydrocarbon-sensing cables and fiber-optic distributed acoustic sensing (DAS) systems. All engineering and test data is shared among committed project partners. Since 2013, the ELDER program has carried out four tests, and collected data from the 13 participating vendors, representing hundreds of recorded leaks in the ELDER apparatus. Data analysis is ongoing, but some participating vendors have already reviewed test results with the intention of using them to improve their systems. The ELDER program is expected to continue into 2016. NOTE TO MEDIA: There is a photo associated with this release. The following caption should be used in association with the photo. 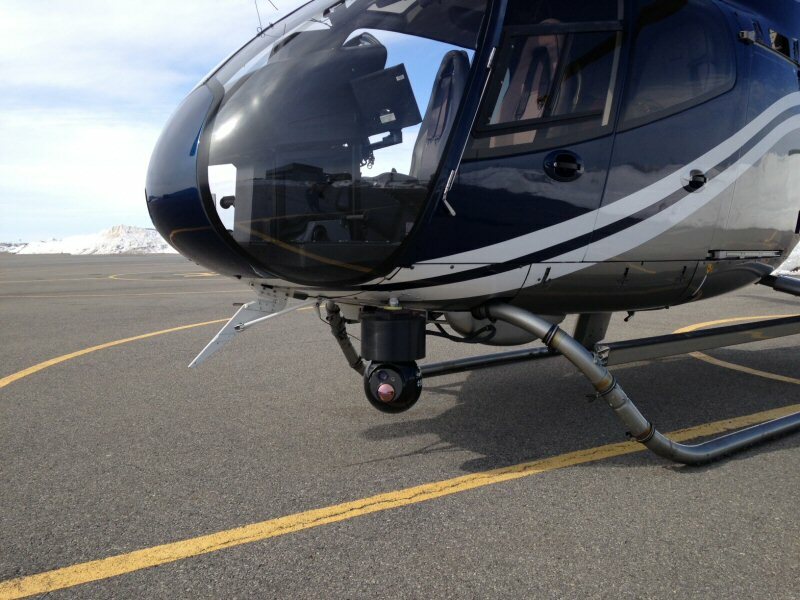 Kinder Morgan Canada, TransCanada Corporation, and Enbridge Pipelines Inc. have signed a Joint Industry Partnership (JIP) agreement to evaluate aerial-based leak detection technologies, possibly including forward-looking infrared (FLIR) technology pictured here, for use with crude oil and hydrocarbon liquids pipelines.